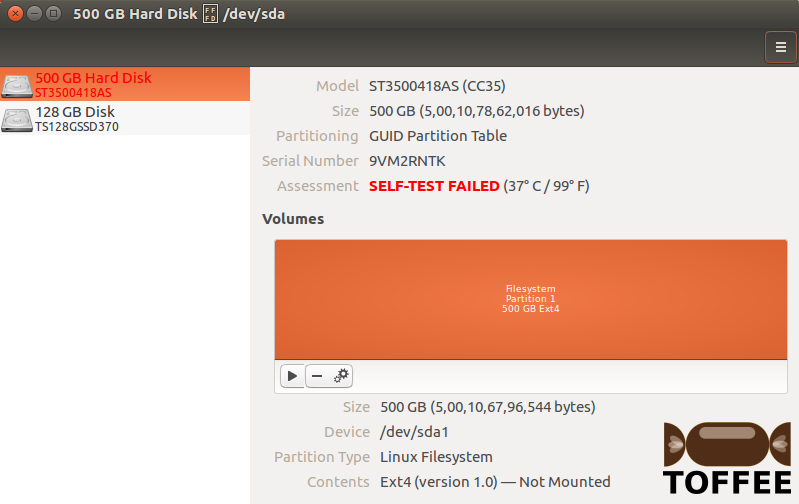 My 500GB Seagate Barracuda 7200RPM hard-drive suddenly started making mild clicking noise. I found this happening since morning. I was suspicious that something wrong in this drive and when I opened the Linux Disks app, I can find the cause of this issue. The disk is increasingly getting read errors. Besides I can see various other parameters such as Power-On Hours, Temperature, Head flying hours, etc. It is quite strange that I never much noticed this tab of a failing disk in the Disks application so thought documenting the same so that you can also monitor the health of your harddrives and SSD drives while it is still partially working. This way you may recover any important files just in case before the drive gets fatally damaged and or data gets lost/corrupt. As you can see below I got two drives installed. One is Seagate 500GB hard drive and the other one is Transcend 128GB SSD drive. The Assessment tells you minor warnings for now such as 2 bad sectors. But it is not sufficient to monitor the drive. So you can open the SMART Data & Self-Tests tab and you get in-depth SMART Attributes. In this you can find detailed information regarding drive read errors, etc, as well as some other interesting data. Now let me compare the same with the working drive which is Transcend 128GB SSD Drive. You can see the SMART Data & Self-Tests tab and you get in-depth SMART Attributes of this working Transcend 128GB SSD Drive. If you notice since it is SSD drive the SMART Attributes information is bit different than the traditional Hard drive. 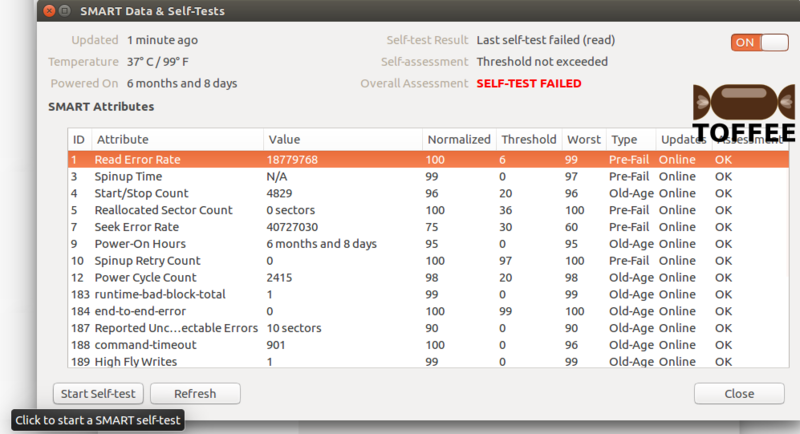 Optionally if you do a Start Self-Test you may get updated Overall Assessment as shown below which shows SELF-TEST FAILED. This is a clear indication it is time to take backups if any, erase the drive, format the drive and purge it ASAP. 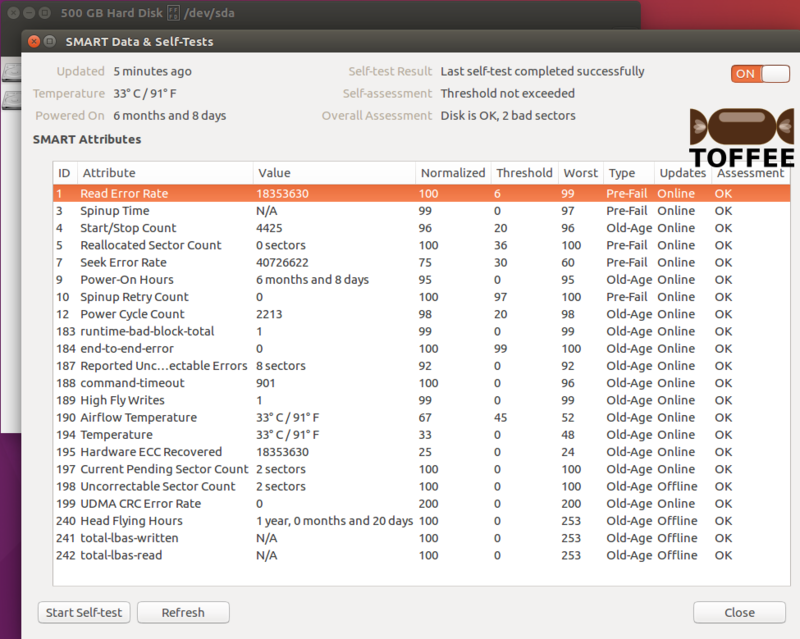 Notice the drive temperature slightly increased after the drive Self-Test.